A 2012 food waste study at a Boston middle school determined that 26.1% of the total food budget ended up in the garbage. If translated nationally for school lunches, roughly $1,238,846,400 annually is wasted. As you can see, schools can play a significant role in reducing food waste. More importantly, a school’s responsibility is to educate the next generation about the resources that go into wasted food and the juxtaposition of food waste and food insecurity to better solve challenges encountered in food systems, locally and globally. An integrated systems approach to reducing waste in the cafeteria offers the most effective long-term solution. Achieving the goal of net-zero waste requires disciple and commitment to meeting three pillars of success: measuring waste, making delicious food that kids want to eat, and connecting the waste reduction process to classroom learning. With these three pillars in place, net-zero transforms from a seemingly impossible dream to a manageable reality. The most important step you can take in your journey to net-zero waste is to measure your food waste. Establishing a baseline for measurement is critical. When you know where you are starting, you can monitor progress and see when you reach your goals. Measurement also provides documented proof of what’s working (or not) and quantifiable data to help you get to the next level. Best of all, when you measure waste and find ways to reduce it, you save money. The financial savings can be used to buy quality ingredients and invest in training to cook better food. School lunch food waste occurs in the cafeteria from sources such as food scraps or uneaten food, meal trays, food wrappers, and beverage containers. Waste is also produced in the kitchen. For example, there might be ends or peels that are inedible, more food made than is needed, and food that goes rotten or expires before staff are able to use it. Additionally, food is delivered in boxes, cans, plastic, and other materials that contribute to overall waste production. Julie Levin, the executive chef at Nardin Academy in New York, started measuring waste in the school cafeteria six years ago as part of a schoolwide sustainability initiative. Going from throwing everything in the garbage to sorting and weighing nearly a dozen waste streams was “a new manner of thinking that required a long-term perspective.” However, the Nardin dining hall and kitchen were committed to going zero waste. Levin’s investment in the sustainability initiative helped her through the challenging first weeks of learning a new system and feeling grossed out with her hands deep in garbage throughout the day. Refining the food waste collection systems and identifying strong partners eased the transition to the smooth operation it is today. Nardin’s cafeteria staff started out collecting waste in five-gallon buckets. This proved to be quite the challenge. The buckets were heavy, had to be washed, and required coordination with a busy maintenance department for transporting to the compost location. Storage was also an issue: the buckets had to be kept in the freezer during the summer to avoid smelling and attracting pests, and froze in the winter when placed outside. Natural Upcycling came to the rescue by offering bigger units to collect the food waste. These units were not as messy to handle by the cafeteria staff and offered an easier collection process. A chalkboard wall above the food waste collection bins in the cafeteria highlights the percentage of waste diverted each year of the program – 86%, 89%, 90%, 85%, and 86%. Despite paying for this service, Nardin Academy saves money in the form of transportation costs, staff time, and coordination with other school departments. This money is reinvested in the school meal program. In the first year, Nardin purchased almost a quarter of its food from local farms and nearly half of its food from fresh ingredients. Also during this time, the cafeteria saw an increase from approximately 80 to an average of 500 lunches eaten per day. In this time of fast food where kids mistake potatoes for rocks and school cooks are more accustomed to opening boxes than using a knife, making food taste great is no easy feat. But with a strong intention, culinary training, and continual taste tests and surveys, delicious food will follow. It also helps to remember that school lunches contribute to student food palates during formative years, helping inform lifelong patterns of eating behaviors. Involving students in the menu development process serves two purposes: 1) it engages them in the program so they feel invested, and 2) helps refine the menu to their preferences. Adults who make decisions about what kids want to eat often miss the mark. Taste tests and surveys offer two simple, accessible ways of connecting students to the meal program. In Hawai‘i, Kohala School Complex cafeteria staff taste tested six different pizza recipes on six different days before students exclaimed “this is it!” Then they put it on the menu. At Mililani High School, 120 student senate members shared their desires for the meal program, 268 students participated in taste tests and provided written feedback for spaghetti and meatballs, and 817 students shared their opinions about new menu items in eight surveys conducted throughout a semester. The student satisfaction rates ranged from 78% to 100% for the eight surveys. 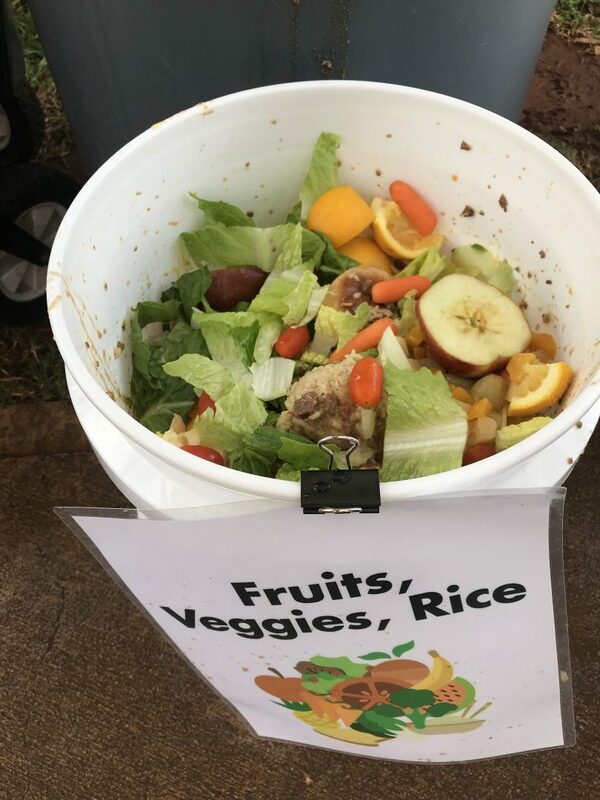 As a result of listening to student preferences at Mililani High School, plate waste went from 142 pounds per day to 31 pounds. Meanwhile, cafeteria staff went from making an extra 4,703 lunches to 1,667 in just three months. This example shows that partnering with students to develop menus is a win for everyone. Students eat more healthy food, the cafeteria has more money to purchase local food to support the community, and less waste produced contributes to a healthier planet. Without connecting waste to broader issues, students can be left feeling like they are rooting around in the garbage for no good reason. When participating in a waste audit last year, Webb’s students saw a dramatic difference in the amount of food their classmates were eating when the cafeteria team cooked local food from scratch. Webb’s students conducted a simple online diet investigation and found that many of them scored low on key nutrients. Building on this learning, this year’s class is studying a group of students who eat school lunch and a group who doesn’t to determine whether students who eat school lunch are getting more nutrition. Webb’s students have also studied their food footprint, tying global concepts to their backyard through hands-on learning. In studying food miles data, students determined on their own that they should grow small gardens at home (focusing on salad greens to start), increase food purchases from farmers markets, and eat more vegetables – all methods of reducing waste. 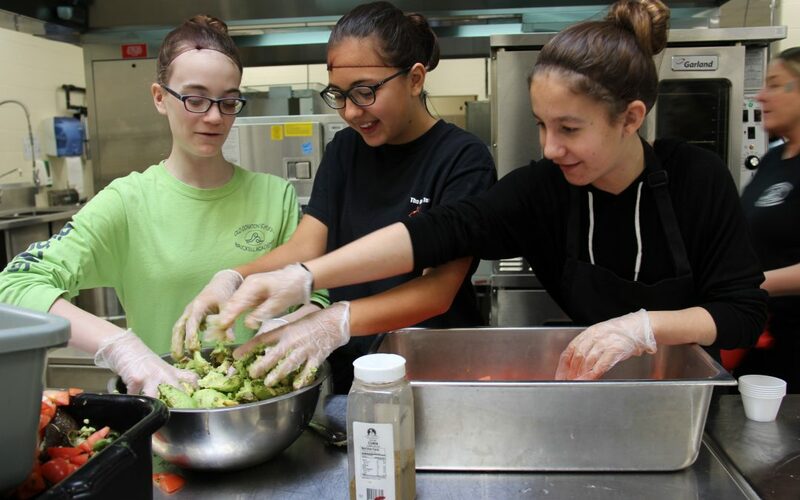 Middle school students at Old Donation School in Virginia participated in a Top Chef style cooking competition where they worked in teams to plan, prepare, and serve a U.S. Department of Agriculture approved school lunch. When students worked in the kitchen to prepare the meal, they weighed the waste. When they worked in the cafeteria, they showed their fellow students how to separate their meal into the various waste streams. Being a part of the meal process opened students’ eyes to the amount of waste produced by their cafeteria and inspired them to take action. When speaking in front of the school board advocating for a districtwide scratch cooking program “students pointed to the amount of waste as demonstration of the need,” according to Rachel Thompson, Department Chair for Exercise Science/Health and Physical Education at Old Donation School, who oversaw the cooking competition. Net-zero waste can seem like a daunting challenge, but it doesn’t have to be. Start with one of these three pillars and work your way to incorporating each into your school cafeteria’s operations. Before you know it, net-zero waste will no longer be a pipe dream. It’s just one decision away. Greg Christian is a highly successful consultant, chef, author, and entrepreneur offering solutions to help transform food service into a more sustainable entity. Greg’s efforts as founder and developer of the Organic School Project have been recognized on local and national levels. His involvement with the Organic School Project and strong background in the food service sector led him to launch Beyond Green Sustainable Food Partners, a sustainability consulting firm, which provides organizations in the food service industry with in-house dining services, sustainable solutions, implementation strategies, and the expertise to adopt sustainable operations. Marnie Record is the communications director for Beyond Green Sustainable Food Partners. She works to build community-based food systems centered on the culture and agriculture of the place. Marnie developed an accredited Value-Added Local Food certificate program for farmers and food producers to gain culinary and business skills and co-wrote a curriculum for food service managers and schools to implement farm to school programs. Marnie writes for industry publications and news sources advocating for local, community food systems.